Quite simply, it means farmland values are not completely immune to the same price swings and cycles that govern all the agricultural markets. Let’s not get ahead of ourselves. Farm Credit Canada’s annual farmland values report for 2018 won’t be released until April so we won’t know definitely until then whether values were up, down or sideways compared to 2017. The smart money, is on sideways to perhaps a bit higher for Canada overall and on another notch higher, for Ontario. What we’re not going to see is the kind of gains that accompanied and followed the big boom years in agriculture, when corn futures jolted to around US$8/bu and soybeans pushed up to around $18. Not coincidentally, Canadian farmland values jumped an average of 19.5% in 2012 and 22.1% in 2013 – the same years when farmers were experiencing record high commodity prices and optimism in the industry was running as high as the prices. Of course, as commodity prices have cooled, more recent farmland value gains have been more modest, up 8.4% in 2017 and 7.9% in 2016. Meanwhile, a look back in history shows a continued good correlation between land prices and commodity prices. In the late 1990s and early 2000s, when soybeans sometimes traded under US$5/bu, Canadian farmland values essentially just held steady, posting gains of only 0.2%, 1.5% and 1.4% from 1999 to 2001. 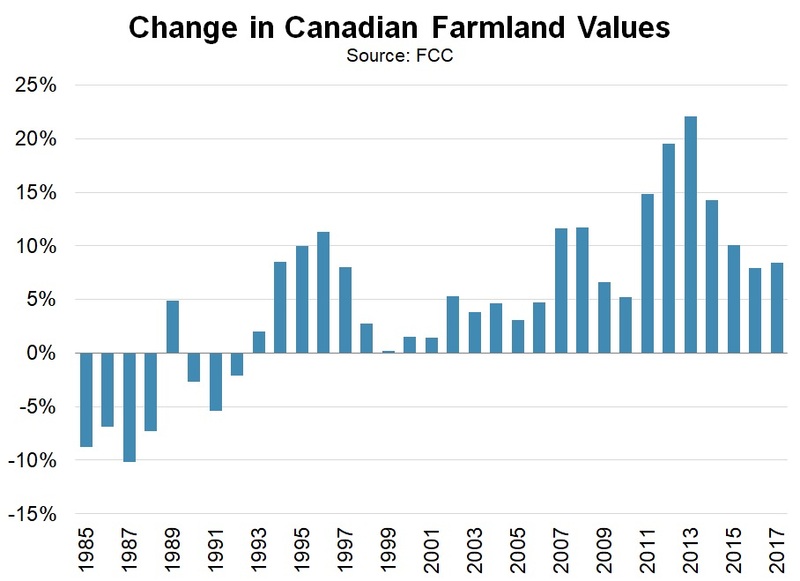 In the bad old years of the 1980s, amid weak prices and double-digit interest rates, Canadian farmland suffered badly, only posting a single annual increase in value between 1984 and 1993. It bears mentioning the farmland value trend south of the border is flat to lower. According to Nebraska-based Farm Credit Services of America (FCSAmerica), benchmark farmland values in Iowa – which generally is on the leading edge of changes in the real estate market – declined 1.4% in the last six months of 2018. As crop prices have come down, a weaker Canadian dollar – which has helped support Canadian farm income compared to the US – and low interest rates have managed to offer enough support to keep farmland values in most locations of Canada from tipping into decline. However, with the dollar notching a major low in January of 2016 and trending sideways between about 72.50 and 81.50 US ever since, that pillar is no longer as supportive as it once was. And with interest rates no longer trending clearly lower and by some measures trending up, that pillar also may be crumbling. In the end, Canadian farmland values will always have their own unique set of influences but will also have similarities to free-market commodities and industry sectors in the sense that they will swing from high to low and back again. That’s something the Ag-Alert and DePutter Market Advisory Service newsletters follow for you: the mega swings in the background for commodities and also other important aspects such as industry profit cycles. . . along with ag assets, including land. To keep in touch with all of the trends and cycles affecting agriculture, try out our weekly Market Advisory Service Newsletter (West) or Ag-Alert service (Ontario). Like a full-time professional marketing consultant for your farm.